MoWeS had been my choice for local web tinkering (WordPress and more) for a while, but as I feared slow development got it. Huge pain to update and after some months Apache started to constantly crash. Since I had not found much portable web server alternatives last time I had to turn over all stones again and this time I ended up with Uniform Server – portable and open source web development stack. 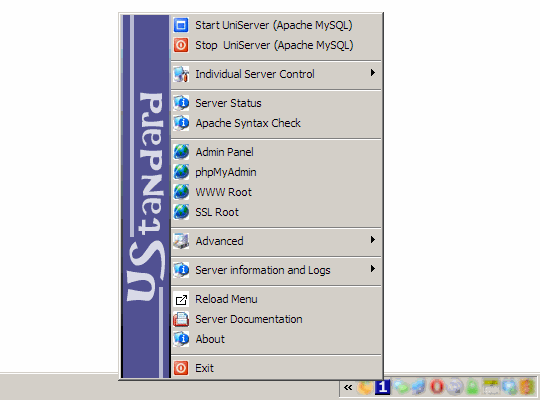 As other apps of this kind Uniform Server is mostly launcher and configuration tool for set of staple web server components – Apache, MySQL and PHP. Launcher part is quite intrinsic – there is tray application, but also plenty of batch scripts that can be called directly. Which in turn call PHP scripts to perform actions. It may seem bulky but actually refreshingly open and accessible to tweak. For configuration there is in-browser control panel that covers (among other things) informational stuff (like error logs), some basic configuration and setting up passwords. 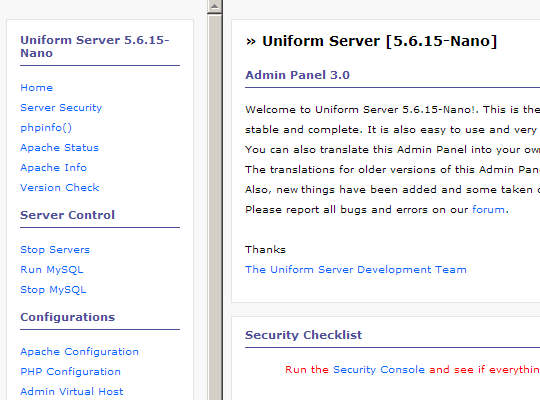 Uniform Server seems to be actively maintained and component versions are maybe not bleeding edge but still one of the latest. Server comes with eAccelerator (PHP opcode cache) out of the box and it makes PHP performance very snappy. Subjectively faster than APC setup I was using with MoWeS, but that is probably due to other configuration factors. While a lot of such stacks are only intended for test and private usage, Uniform Server openly says that it is suitable to run in production environment (after setting all passwords and such of course). Folder structure and redirects are somewhat more complex than I am used to, will take some time to figure out. Other than that I had absolutely no issues with this stack so far. I hope it will be same in the long run. Robust, well-performing and well-maintained choice for a test stack. Solid enough to be used in production. I don’t know if you already reviewed it, but I use the lite version everyday running a personnal dokuwiki with it at work. It is portable if you manually start/stop the services. But I admit it is big at 61MB zipped, I don’t remember the unzipped size. Tried XAMPP more than once and it sucked. I had nothing but issues with their launcher. One time had to look for alternate launcher just to start the thing, because bundled on failed. Of course this is just my unfortunate personal experience. I know it works fine for plenty of people. I’ve been using Uniform Server for years myself, i always found it better than xampp, then again i’ve only ever installed xampp once, maybe twice, but had issues with it(like you – though can’t remember specifics). It wasn’t as good in prior versions, but it’s definately a top notch application now. Previously it had this whole drive emulation rubbish(virtual drive), which while useful meant you couldn’t properly access your files without starting the app(not entirely true, but read on) and additionally if you fired up your text editor and it was tracking recently opened files, had you opened it without starting the server it would point at non-existant files and of course not open them(because they were referencing files on a drive that wasn’t available, a virtual drive) – so you’d have to navigate to the files and open them again. Of course there was a real location for the files, but the editor would be referencing the virtual location. Yep, current experience is definitely way more smooth then what you are describing. My only gripe so far is no (?) upgrade capability. From what I understand to bring your stuff to newer Uniform Server version you pretty much have to do server migration.